Most acrylic built up letters are made in a block bold font like Helvetica Bold or Clarendon Bold or similar type font. The letters can be illuminated with LED. The letter face is first cut out using a cnc router, strips of acrylic are then cut to length and bent into shape to create the return on the letters. The components are then glued with a welding glue. Fixings are then glued to the back of the letters to allow the letters to be fixed to a fascia panel. Most of the 3D acrylic leters that we make and supply go to our customers for DIY fitting unless the customer is local to us. Metal is an ideal material to use for shop signs where they are being located at a low level. Fixed direct onto a brick or stone wall, screw fixed and secured. Text and image are printed onto a vinyl which is then mounted onto the aluminium sheet. dali, a photo by Signmakersuk on Flickr. 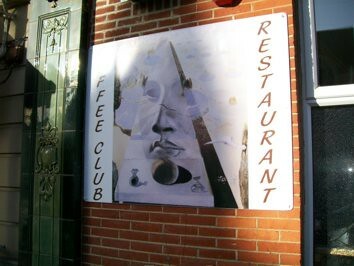 A Dali painting printed onto a sheet of aluminium composite and fixed to a wall. 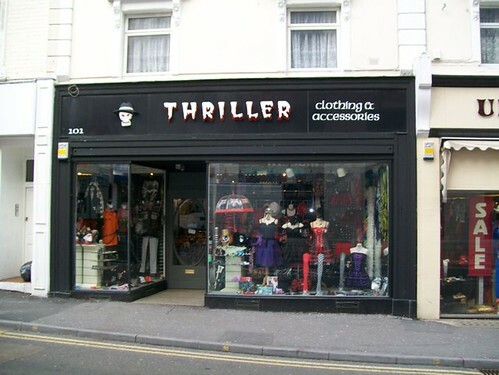 A sign located at the Triangle in Bournemouth called ‘Thriller’ The shop front sign with 3D skull logo and 3D gothic letters with stand off fixings was fitted onto a black gloss sign located in central Bournemouth. The sign was fitted in 2010 and is still looking good in April 2016, although it could do with a wash. The letters were cut from a dense polystyrene type material known as styrofoam, the letters were then painted with a masonry paint, white face and blood red painted sides. The skull was hand carved out of the styrofoam and coated in a thin layer of Jesmonite for added durability although I don’t think it needed it in the end. Arro Signs make and supply a range of sign products, we focus on Shop Front Signs on this blog. Arro Signs also make and supply 3D letters and logos made from perspex, stainless steel, Resin and Solid wood Composite as well as Styrofoam and Polystyrene. www.arro-signs.co.uk we also have a blog at www.arro-signs.co.uk/blog as well as various other niche information blogs which we are developing. We also make and supply stainless steel plaques and Brass plaques. Over the years we have developed a range of metal sign letters. Gold acrylic 3D letters made for Hotel Name Signs and Restaurant Name Signs. ABCDEFGHIJKLMNOPQRSTUVWXYZ of gold moulded letters. made for pub name signs.